Minister of Health, Nutrition and Indigenous Medicine Rajitha Senaratne stated that he demands the President and the Prime Minister to fulfill the promises given when the Yahapalana government came into power and to execute good governance in the country. 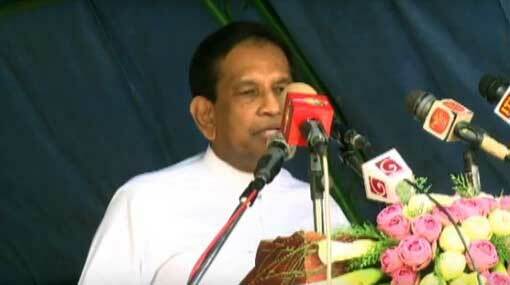 He stated this joining an event in Minuwangoda. The event was held under the patronage of Minister Rajitha Senaratne and Gampaha District MP Chathura Senaratne to declare open the new ‘Seva Piyasa’ building in Horampella area in Minuwangoda last morning (21). The ‘Seva Piyasa’ building has been established with the decentralized provisions of MP Chathura Senaratne. Commenting further, Minister Rajitha Senaratne stated that, if only former President Mahinda Rajapaksa had listened to him and implemented what he told, he would still have been the president. “The former President must now be recalling what I said back then,” he said. Minister further said that he is against the ‘assassination culture’. Two good leaders have been appointed as the President and the Prime Minister, however, there are certain members, like fleas, who spoil the brains of these two leaders, the Minister accused. According to him, some people are trying to sabotage the revolution of January 08, which he risked his life for. Stating that the leaders also have forgotten the past, Minister Senaratne commented that the traitors who intend to destroy the peace within the governments will be revealed soon.